film award this month. The Oregon International Film Awards awarded South Texas Gentle Men of Steel – Los Padres its highest-level honor, a Platinum Award. In addition, the documentary was invited by the organizing committee and screened at the International Congress, entitled Dominicans in the Promotion and Defence of Human Rights: Past, Present and Future, in commemoration of the Order’s 800th anniversary, held in Salamanca, Spain, Sept. 1-5, 2016. The award letter from the Oregon International Film Awards, states, in part: “Our selection committee reviewed several hundred projects originating from many countries around the world, with your select group of films and screenplays emerging as the very finest. Congratulations on your outstanding work!” The Oregon International Film Awards is an international recognition platform and awards body receiving and evaluating new work from both emerging filmmakers and masters of the craft originating from nations from around the globe. “We are very honored to have screened at Salamanca, and are excited about winning the Platinum Award, a prestigious award, topping our festival circuit run,” said writer-producer-director, Armando P. Ibáñez, O.P., a friar of the Southern Dominican Province. “We’ve completed our festival run, and, thank God, we have excellent awards under our belt. Hopefully, these honors will help us find distribution in either television, Internet streaming or, ideally, both,” said Ibáñez, who teaches filmmaking at Texas A&M University-Kingsville, Texas. “Dominicans may be interested to know that we are working on a new short documentary about the Salamanca congress. We hope to have it done in a few months,” he added. 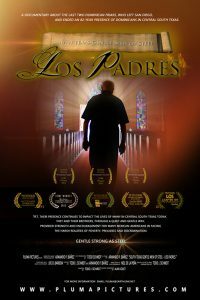 The documentary is about the end of an 82-year presence of Dominican friars in South Texas, primarily around Alice, San Diego and surrounding area, with the departure of the last two Dominican friars, Fathers Epifanio “Epi” Rodriguez, and Benito Retortillo, who left the area in 2013. Dominican friars, headquartered in San Diego, had a powerful and lasting impact on the history and development of central South Texas, especially on how their presence assisted many Mexican-Americans struggle against injustice and harsh racism, which bespeaks of the experiences of many in the Southwest. The documentary was made possible by a dedicated and talented crew. They are: Todd Schmidt of Slidell, LA, co-producer, editor and special effects artist; Emmy Award Nominee, Joe O. Barrera of Los Angeles and native of San Diego, music composer; Neil de la Peña of Los Angeles, Director of Photography; and Alan Jouet of New Orleans, audio engineer. The documentary is produced by Pluma Pictures, Inc., a non-profit film production company. The board of directors are: Dr. Thomas Hedberg, Dr. Erlinda Grey, Ned Greene, all of Los Angeles, Christopher Renz, O.P., Berkeley, Bruce Schultz, O.P., Atlanta, Dr. James Moises, New Orleans and Michael Paz, Destrehan. The other 10 awards are: Award of Exceptional Merit, Docs Without Borders, Documentary-Feature Length; Award of Merit, Accolade Global Film Competition, Documentary-Feature Competition; Silver Palm Award, Documentary, Mexico International Film Festival; Gold Award, Documentary Feature, Gold Award, Directing and Gold Award, Animated Visuals, International Independent Film Awards; Award of Excellence, History/Biographical, and Award of Merit Special Mention, Christian, The IndieFest Film Awards; Best Documentary, iHolly Next Generation and Gold Remi Award, WorldFest Houston.